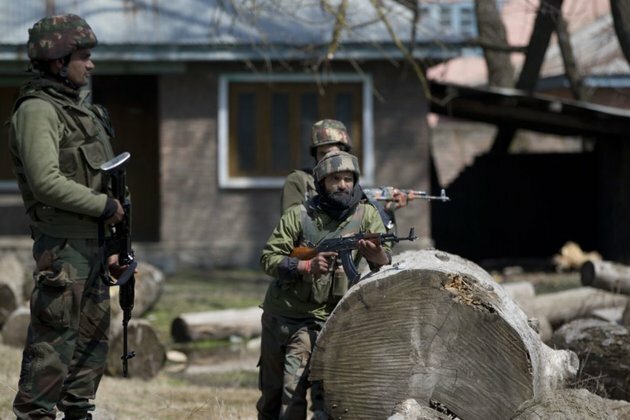 SRINAGAR, INDIA - Indian security forces on Friday killed seven militants who they said belonged to Pakistan-based groups during four gunbattles in Kashmir the highest number of clashes in a single day in recent years. Police said the militants belonged to Lashkar-e-Taiba and Jaish-e-Mohammad (JeM). JeM claimed a suicide attack last month that killed 40 Indian paramilitary troopers in Kashmir and brought the arch rivals to the brink of their fourth war. India has since stepped up an offensive against separatist militants in the mountainous Muslim-majority region that both countries claim in full but rule it in part. Since the attack on Feb. 14, Indian authorities say 22 militants have been killed in Kashmir. Three of the gun battles, one in North Kashmir's Baramulla district bordering Pakistan, started on Thursday. A police spokesman said they were from Pakistan and had been active in the region, attacking troops and harassing civilians. Indian authorities on Friday imposed restrictions on the movement of people and vehicles in parts of Srinagar, Jammu and Kashmir state's summer capital, after separatists called for protests against the death in custody of a man who detained by police for suspected links with militants. Police said he had been trying to escape and inquiries were being carried out into the cause of his death. His brother, Zulkarnain Asad Pandit, rejected that and said he had been tortured in custody. Indian authorities on Friday also banned another separatist organization in Kashmir, the Jammu and Kashmir Liberation Front.